I. What is a Mnemonic? PEMDAS – Please excuse my dear Aunt Susie. 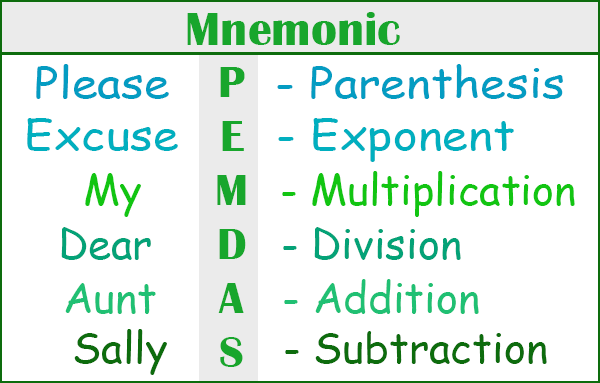 PEMDAS is a common mnemonic for remembering order of operations in pre-algebra meaning: Parentheses, exponents, multiplication, division, adding, and subtraction. This mnemonic is useful for remembering the strings of a guitar in proper order from left to right. This phrase is a mnemonic which reminds spellers that typically the letter i comes before e and after c. For example, the words “lie,” “belief,” and “pie” all have i before e. Words like “deceive” and “ceiling,” on the other hand, have e before i, following the letter c.
Connection mnemonics are used when one can make a connection between something already known and the new thing to memorize. For example, imagine you meet a new boy named Brian who has a bowl cut. You can remember his name by saying Bowl Cut Brian in your head—the connection of his haircut with his name and the “B” alliteration is a helpful memory aid! This type of mnemonic is self-explanatory: many of us simply remember better when music goes along with the phrase or concept we are learning. A simple example of this is using the “ABC” song to learn the alphabet. With this type of mnemonics, the first letters of the words within a phrase are used to form a name. Memorization of the name allows for memorization of the associated idea. For example, Roy G. Biv is a name used to remember the colors of the rainbow: red, orange, yellow, green, blue, indigo, and violet. In this common type of mnemonic, the first letter of each word in the phrase is used to create new words with a memorable phrase. One example of this is the 7 coordinating conjunctions For, And, Nor, But, Or, Yet, and So which create FANBOY. There’s a rat in separate. Mnemonics are cheat codes for those who struggle with memorizing a certain complicated subject, list, or concept. They allow us to use more memorable phrases that tie the concepts we want to memorize to our minds. They allow us to quickly and successfully learn, and remember key concepts in a variety of subjects from English to math. They work because our minds tend to remember information to which we can relate or experience. Mnemonics have been proven to work as tools of memory-forming for a variety of tasks. They aid doctors, scientists, geologists, artists, and students. If you’re struggling to remember something, consider making yourself a mnemonic. Wherever there is a Q there is a U too. This literary mnemonic reminds us with rhyme that Q’s are followed by U’s in spelling. We hear with our ear. For those who are Who-obsessed, the actors who have played the doctor in the show “Dr. Who” can be remembered in chronological order with this phrase. They are: Hartnell, Troughton, Pertwee, Baker, Davison, Baker, McCoy, McGann, Eccleston, Tennant, Smith, Capaldi. This mnemonic uses pop culture to help children remember steps to complete division problems: divide, multiply, subtract, compare, and bring down. Acronyms refer to words formed from abbreviations of certain phrases. For example, NASA is an acronym for National Aeronautics and Space Administration. Acronyms are often used as mnemonic devices. For example, the acronym HOMES can be used to remember the Great Lakes: Huron, Ontario, Michigan, Erie, and Superior.